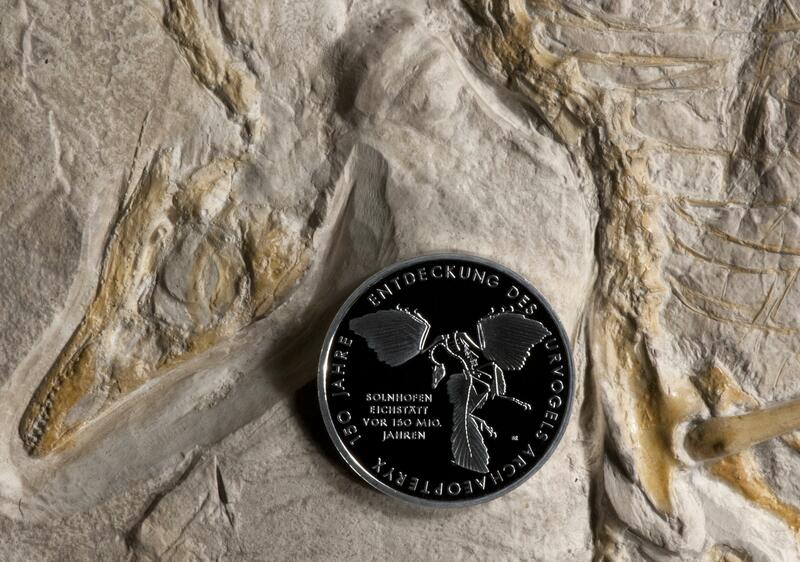 Germany commemorated the 150th anniversary of Archaoepteryx with a 10-Euro silver coin, shown here on the WitmerLab cast of the Berlin specimen. What a remarkable 150th birthday year it’s been for Archaeopteryx! Sesquicentennial celebrations, commemorative coins and stamps, historical articles, and special exhibits would have been enough, but Archaeopteryx made headlines when a prominent study in the venerable British journal Nature announced that it might not be a bird after all. That study was rebutted by another prominent study, which was in turn rebutted at a prominent conference. If that weren’t enough, an entirely new specimen of Archaeopteryx—only the 11th ever discovered—was announced. Let’s have a closer look at this very eventful year. Celebrating the 150th birthday of Archaeopteryx with a gift for us all! The actual 1861, two-paragraph article with the single, controversial sentence pulled out that names Archaeopteryx lithographica. It was 150 years ago today, on 30 September 1861, that Hermann von Meyer gave the name Archaeopteryx lithographica to the feathered animal that fluttered over the Solnhofen lagoon in Late Jurassic Bavaria. At right is the entire published article…a scant two paragraphs, only one of which is devoted to Archaeopteryx. In that one paragraph he announced the discovery of a feathered skeleton, to go along with the isolated feather that he had announced six weeks earlier. 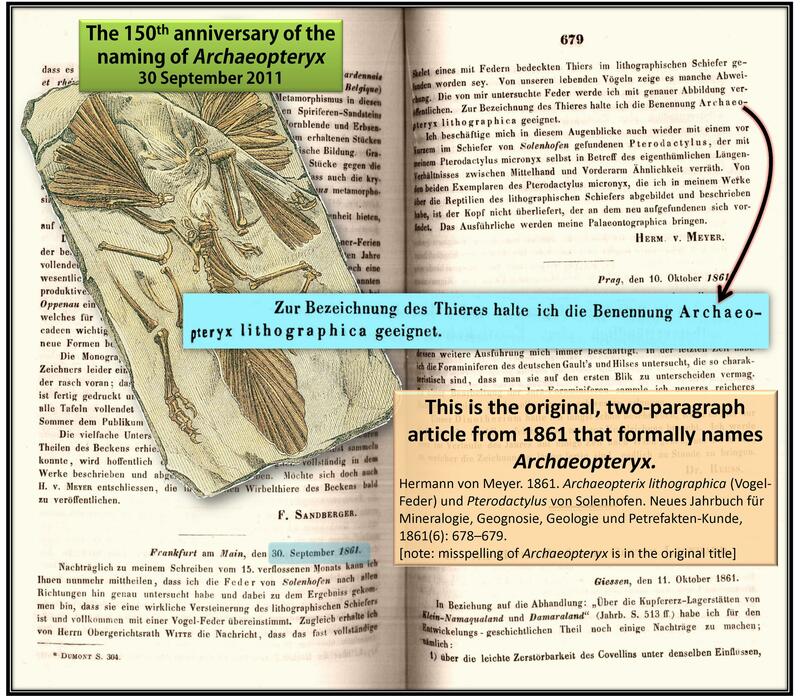 For decades later, scholars argued over his key statement: “For the denomination of the animal I consider the term Archaeopteryx lithographica as appropriate” (the original German sentence is pulled out in the illustration). He named the animal, but not a specimen. Modern rules dictate the designation of a “holotype” specimen that officially bears the name. Should it be the feather, the skeleton, or neither? 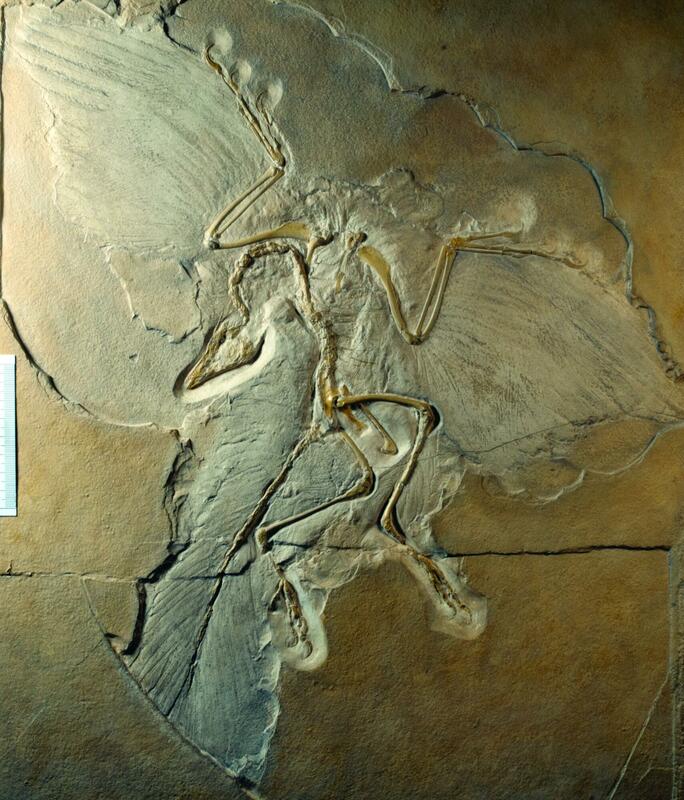 I discussed this debate a little in my first Archaeopteryx sesquicentennial post, but the result has been that the skeleton—now known as the London Specimen (BMNH 37001)—is the holotype. Happy 150th Birthday, Archaeopteryx! 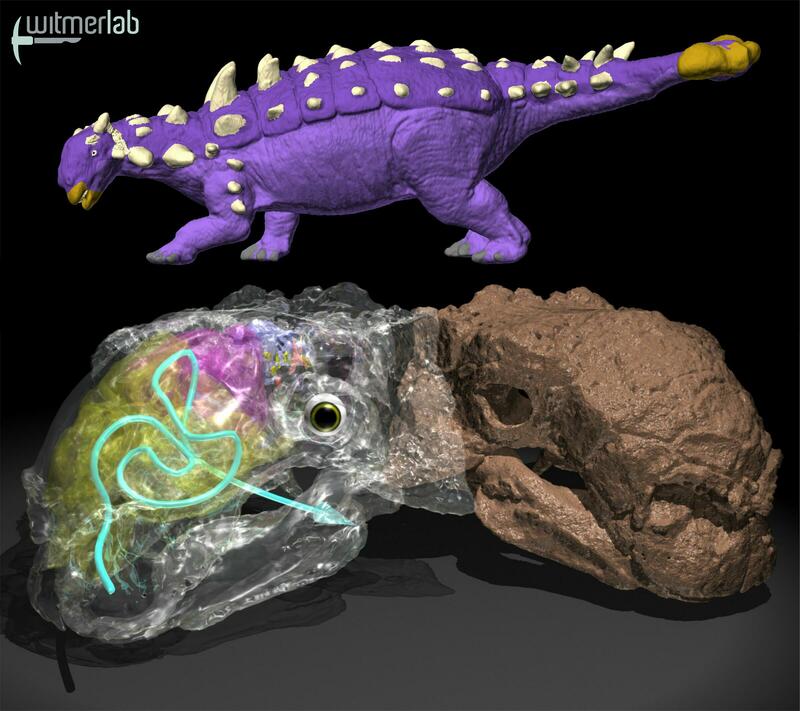 To celebrate, WitmerLab is launching today a website with five sets of interactive 3D PDFs of skull or skull parts of three Archaeopteryx specimens, including the one von Meyer announced 150 years ago today. It’s all open access and freely downloadable! 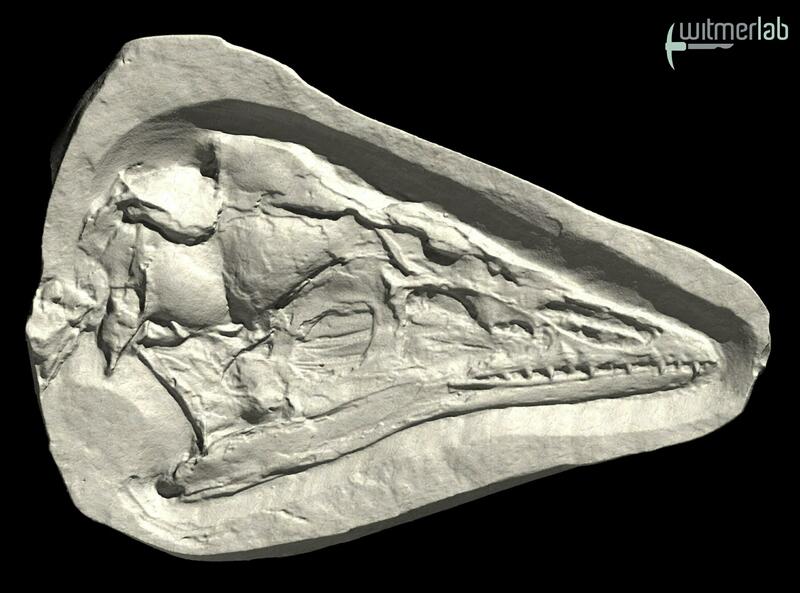 The skull of the Eichstätt Archaeopteryx (JM 2257), based on microCT scanning of a high-resolution cast made by Peter Wellnhofer for Witmer. An armored dinosaur gets a second opinion—and the crazy-straw nasal passage survives! The ankylosaurid armored dinosaur Euoplocephalus (AMNH 5405). A new article confirms the highly tortuous “crazy-straw” nasal passage coiled up within the snout..
Dinosaurs…in a med school? Some paleontologists lead parallel lives in medical education. WitmerLab members are like many paleontologists in having their teaching responsibility in the medical gross anatomy lab. Here Witmer and grad student William Porter work with OU-HCOM med students. August is vacation time at most universities. For members of our research lab, however, summer is the busy season. 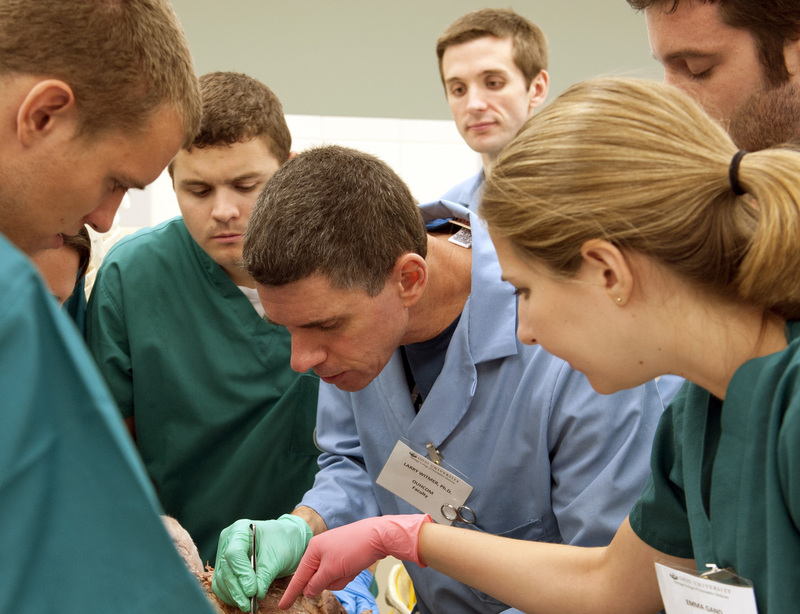 We’re completely consumed by teaching a comprehensive medical gross anatomy course at our academic home, the Ohio University Heritage College of Osteopathic Medicine (OU-HCOM). “Wait…what? I thought you were dinosaur guys…paleontologists, not medical people.” I get that all the time. We’re both, and it’s not as crazy as it sounds, nor as unusual as you might think. The Discovery Channels in the UK and the US recently have aired documentaries called “Dino Gangs” that follow dinosaur paleontologist Philip Currie around the globe (Alberta, Mongolia, Indonesia, South Africa, Great Britain), including little Athens, Ohio, the home of Ohio University. “Dino Gangs” addresses Currie’s theory that tyrannosaurs hunted as cooperative, social packs. Phil and the film crew from Atlantic Productions were here to talk with me about my work with Ryan Ridgely on tyrannosaur brains and sensory capabilities…basically whether tyrannosaurs had the mental wherewithal to pull off pack hunting. Phil Currie and his collaborators have published a few articles that have alluded to the possibility of coordinated, social, pack hunting, mostly notably his 1998 article in Gaia. My goal here is neither to evaluate the nuances of his arguments (e.g., the taphonomic issues) nor to address the media hoopla from the folks at Atlantic, the same folks who brought us Darwinius and Predator X (check out Brian Switek’s thoughtful response). My goal is simply to relate what went on here in Athens and to clarify how I think tyrannosaur neuroanatomy fits into the argument. Cover of the issue of the Journal of Vertebrate Paleontology in which our Tarbosaurus research is the Featured Article. It's open access and freely downloadable!